We all have that special someone on our holiday list, whose pet holds an inordinate importance in their life. Pets have become very popular over the past 30 years; no longer are dogs left outside on a chain with a wooden dog house! No Sir! Now, all kinds of pets have designer beds, designer crates and even designer foods produced and marketed just for the pet owner. The pet industry has exploded over the last several decades. Most popular items are pet and owner jewelry as well as clothing promoting the pet breed. For example, there are websites specializing in every breed imaginable with an entire line of gifts for the owner of that breed. From silver silhouettes of the breed, to sweatshirts, towels, place-mats, clocks, and even full dish sets, pet owner gifts are very animal specific as well as breed specific. Pet owners try to stay up on innovations to such things as collars or leashes, but truthfully, there simply aren’t enough hours in a day! For that reason, it’s best to think of holiday gifts that would make their life easier. One such gift for the dog lover is a retractable leash with flashlight. 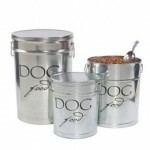 Another great gift idea is an airtight container designed to store food, or treats. If their dog is hard to control on a leash, try giving them a Halti Collar—it is a humane, pain-free way to train a dog to a leash and will make them much easier to take on a walk; no more dragging the owner down the street! Other very popular gift ideas for the pet owner are photo frames, leash holders (that mount on the wall) a grooming kit, a custom made Christmas ornament with a photo of the animal, as well as the much coveted “howl-a-day” Christmas stocking, or the “Purr-fect” Christmas stocking stuffed with breed specific treats. With great love and care for animals a new industry has cropped up specifically with the pet owner in mind. While it may sound morbid to the non-pet owner, to the owner who has suffered the loss of their beloved pet, this unique gift is a keepsake. From the cremated remains of their ever-faithful companion, jewelry can be crafted and worn. A pendant in the shape of a paw, or a bone, or a heart can be made from the ashes of their beloved pet. There are other items for the pet owner to honor their much-loved pet who has passed away, such as an urn necklace as a keepsake. Pets have quickly become as much part of the family as the family! It’s important to give the perfect Christmas gift to the pet owner that recognizes that special bond.